The FERS Supplement is an important benefit for FERS planning to retire before age 62. Since so many Special Provisions (ATC, LEO and FF) federal employees retire before age 62, it’s important to understand who gets the Supplement and how it is calculated. The Supplement also has a few unique rules for Special Provisions FERS employees – and we’ll talk about those shortly. The FERS Supplement is also called the Special Retirement Supplement (SRS) or FERS Annuity Supplement. 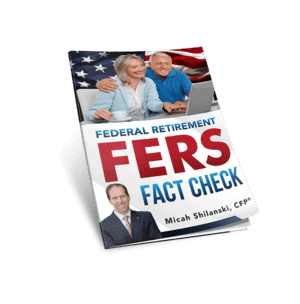 In the federal retirement planning classes I teach, we call it the FERS Supplement or just the Supplement. It is designed to help bridge the money gap for certain FERS who retire before age 62. It will supplement your missing Social Security income until you reach age 62. But not all FERS are eligible to receive the Supplement. Forgive me if the first requirement sounds too obvious – but people really do ask. Yes, the FERS Supplement is only for FERS. The Supplement is unique to FERS – there is no counterpart to the Supplement in the Civil Service Retirement System (CSRS). The second requirement is that you must have a normal immediate retirement. If you do not have enough years of creditable service under Special Provisions – then you can still qualify for the Supplement if you retire under the regular FERS immediate retirement rules. or 20 years of creditable service and be at least 60 years old. And while you can seek a normal FERS immediate retirement at age 62 with 5 years in service – the FERS Supplement is only paid until age 62. So if you retired at 62 with 5 years of service, you would not get this benefit. Most people are fine with an estimate for initial planning purposes. The easiest way to get a ballpark on your FERS Supplement involves your Age 62 Social Security benefit. In order to estimate your Supplement amount, you’ll want to have your annual Social Security statement handy. You’ll also need to know how many years of creditable service you would have at your estimated retirement. Years of Creditable Service: this is the number of years that count towards your retirement. However unique to the FERS Supplement calculation – years of military service that you have bought back for retirement do *not* count in this calculation. However there are some unique exceptions. See Section 51A2.1-3 of OPM’s CSRS FERS Handbook for more details. While you must have enough Special Provisions time to qualify for a Special Provisions retirement – if you have additional years of regular FERS creditable service, you can include those years here too. Your Age 62 SS Benefit: You’ll find this number on page 2 of your Social Security statement. And it doesn’t matter what age you plan to start receiving Social Security – for this formula, you must use the age 62 Social Security benefit amount. You can see that by design, the Supplement will be less than your Age 62 Social Security benefit. Unless, of course, you have 40 years of service. But that would be rare for Special Provisions FERS. Let’s walk through an example together. Say Bob has 25 years of creditable service under Special Provisions. Bob can take an immediate Special Provisions retirement, even though he is only 48 years old. Bob’s Age 62 Social Security Benefit is $1,600 a month. Approximately how much will Bob’s FERS Supplement be? So we take 25 years of creditable service divided by 40. Then multiply that by $1,600 and we get Bob’s FERS Supplement estimate of $1,000 a month. And he’ll receive this supplement once he retires and up until the month he turns 62. But we’re not done quite yet. This is an estimate of the gross amount of the Supplement – but we need to look at the *net* amount Bob will receive. And many FERS who receive the Supplement are subject to a specific reduction. If you will have earned income(ex: a part-time or full-time job) above a certain amount after you retire from Federal service, your FERS Supplement may be reduced. The reduction is significant and because the income threshold is so low. The reduction impacts many FERS retirees, but it is especially important for Special Provisions FERS to understand, since many Special Provisions employees often get full or part-time jobs after their federal retirement. In 2019 the earnings limit is $17,640. What counts toward that limit? Earned income – which is essentially any income you receive as a W-2 wage or as employment income. Your FERS pension does not count towards this amount, only earned income. So if you earn more than $17,640, your Supplement will be reduced. For every $2 you earn above the limit, your FERS Supplement will be reduced by $1. Let’s go back to our example with Bob. Earlier, we estimated Bob’s gross FERS Supplement to be $1,000 a month. Let’s say Bob gets a part time job after his federal retirement – and that job pays him $30,000 a year. His $30,000 income exceeds the $17,640 limit by $12,360. If we take half of this amount, we get $6,180 – which is the annual reduction. Divide that by 12 and we get a monthly reduction of $515. And what if Bob got a higher paying job? Maybe he gets a full time job after his federal retirement – and that job pays him $50,000 a year. Bob’s full time job of $50,000 a year exceeds the $17,640 limit by $32,360. Half of that is $16,180 – which is the annual reduction. Divide that by 12 and we get a monthly reduction of $1,348. If your reduction is more than your FERS Supplement, you simply forfeit your entire Supplement. There is a special rule for Special Provisions retirees, when it comes to the earnings reduction. If you leave federal service on a full and immediate Special Provisions Retirement – you will not be subject to the earnings reduction until the month you reach your regular FERS Minimum Retirement Age (MRA). But, once you reach your MRA – the earning reduction comes into play. Let’s go back to Bob. Bob had 25 years of special provisions time. He took a Special Provisions Retirement at age 48. Bob’s regular FERS MRA is age 56. We’ll say Bob gets a part-time job after federal retirement. That job pays him $30,000 a year. And for the sake of an easy example, let’s say he gets paid $30,000 a year, every year in retirement. Bob’s Supplement will be about $1,000 a month from his federal retirement, up until he reaches his MRA of age 56. But the month he reaches his MRA, age 56, the earnings reduction will come into play. At age 56, Bob’s FERS Supplement would be reduced by about $515 a month (see part-time work example above) – leaving Bob with a FERS Supplement of $485 a month. While Social Security Income is only partly taxable depending on your income – the FERS Supplement is entirely subject to ordinary income tax. Taxes are complex, but for easy numbers let’s say Bob pays 15% taxes. 15% of his $485 supplement would be $73, leaving Bob with a Net FERS Supplement of $412 a month. *The FERS Supplement is also subject to State income taxes, so depending on which state Bob lived in his Net FERS Supplement could be even lower. The FERS Supplement will stop the month you turn age 62. And it stops whether or not you have started drawing Social Security at age 62. Some people may choose to start drawing Social Security at age 62 – but others will want to delay until later. Why would you delay? The longer you wait, the higher your benefit will be. That is, up until age 70. The amount will not increase if you wait any longer than age 70 to draw Social Security. But if you delay drawing Social Security to get a larger benefit – it means you have to go that many more years without the monthly benefit. This can create a money gap – and it’s important to plan ahead for it. While many people turn on Social Security as soon as possible – it usually makes sense to delay if you have planned ahead. Everyone’s personal financial situation is unique – so you’ll want to carefully weigh your financial plans to see when it makes the most sense for you to start drawing Social Security. A good financial planner can help you understand your options and help you make the best choice for your personal situation. Questions about Federal Retirement for Special Provisions? Federal Retirement benefits are complex. And Federal benefits for Special Provisions are even more complex. Are you looking for someone to help walk you through the entire retirement process? My name is Micah Shilanski. I’m a CERTIFIED FINANCIAL PLANNER™ professional who specializes in helping Federal Employees get the most out of their benefits. Many of my clients are Special Provisions federal employees. I’ve helped them navigate the tricky aspects of their benefits and retire successfully or transition into a new job in the private sector. Find out more about having personalized help planning your retirement.